Diamond half eternity ring set with 0.15cts of round brilliant cut diamonds within a channel set 2.45mm wide band. A timeless Round Brilliant cut Diamond half Eternity Ring. This classic ring design is channel set with a total of 0.15 carats of exquisite Round Brilliant cut Diamonds, that have been graded F Colour and VS1 Clarity prior to setting. 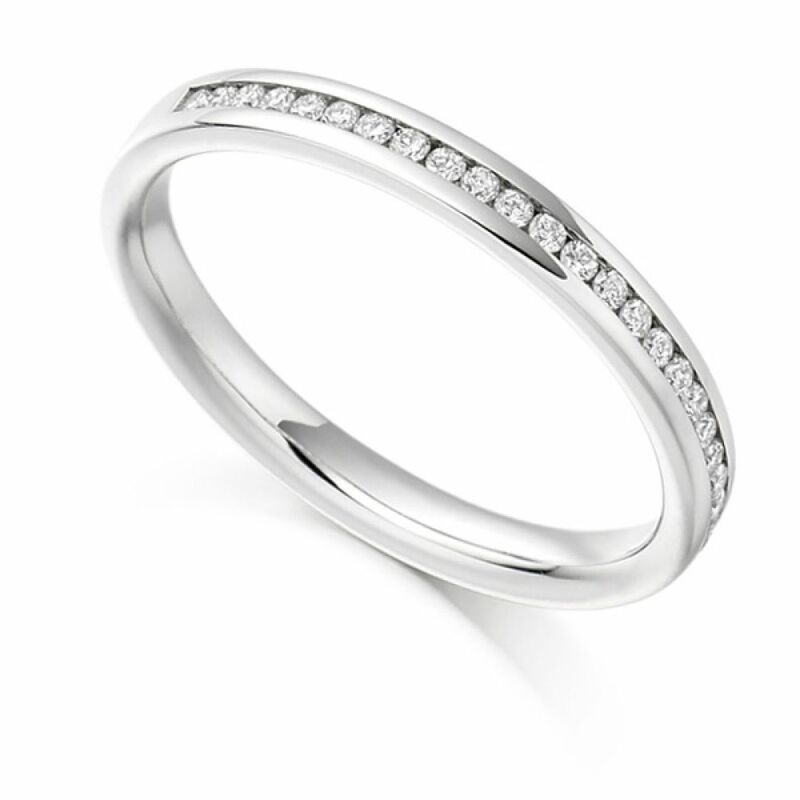 The ring benefits from a court profile and is a slender 2.45mm in width. Available in a choice of finishes 18 Carat White, Rose or Yellow Gold and 950 Platinum or Palladium, to suit your personal preference. The ring arrives beautifully presented and packaged ready for that special occasion. Please allow up to 4 weeks for delivery as this design is crafted to order, ready to be enjoyed every day. All deliveries of diamond wedding rings and diamond eternity rings to Australia are sent by Fedex. We include all shipping and duty before you make payment so that all you need to do is await your parcel and sign at the door. All items are exquisitely boxed in a presentation box, within a secure, rigid outer box. We send all items under plain cover and fully insure your parcel until it arrives. Get in touch for friendly advice. If you need any advice about any of our diamond wedding or eternity rings or products, please get in touch for some friendly, expert advice. We are available online and by phone, or send us a message through our online chat system. Claim your free finger size tool. We'll gladly send you out a free ring size tool. Just order below and we will send this directly to Australia by airmail in a plain white business envelope. Alternatively you can contact us with your local size reference and we can work to this for you. Service rating :Fantastic. I had loads of questions about what ring was right for me and they were great. Professional, timely and organised. Would use again! Product : I purchased a wedding ring so not wearing yet as wedding in Oct but have tried it on & love it! Beautiful!